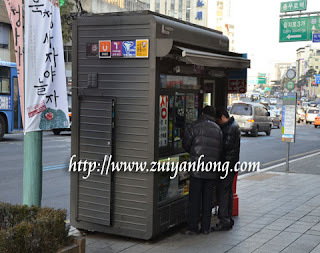 If you had been to Seoul of South Korea, perhaps you had seen this rectangular convenience stall along the bustle street. Although this stall is not big but you can get many stuffs which you are needed. Tired of traveling, stop and take a break. Have a bottle of Korean drink and continue your journey. In case you need to board a bus or subway, Upass and Tmoney are available at this convenience stall. With either Upass or Tmoney you are able to travel to any corner of Seoul.